Thermos, a premium brand in drinking containers presents "Summer Fun with Thermos Photo Caption Contest." This contest runs from March 16-May 17, 2012. 1. Participants must like the Official Thermos Philippines Facebook page and follow Thermos Philippines on Twitter. 2. Photo entries must have their corresponding captions (maximum of 140 characters) that adhere to the theme for the period. The picture can be in JPEG or PNG formats, with a maximum size of 4MB. 3. Only color, brightness and contrast of the photo entry are allowed to be adjusted. Complete name of model/s (Prior written consent from the model is required for pre-screening whereas the scanned letter of authorization should be attached to entry). 5. Photo entries and their corresponding caption will be screened. Illegal, immoral, visually disturbing, derogatory/hate, foul and sexually explicit photo entries will be automatically disqualified. 6. Only photo entries and their corresponding caption published in the ThermosPhilippines Landing Page which is supported by Manila Exchange website are considered for the promo. 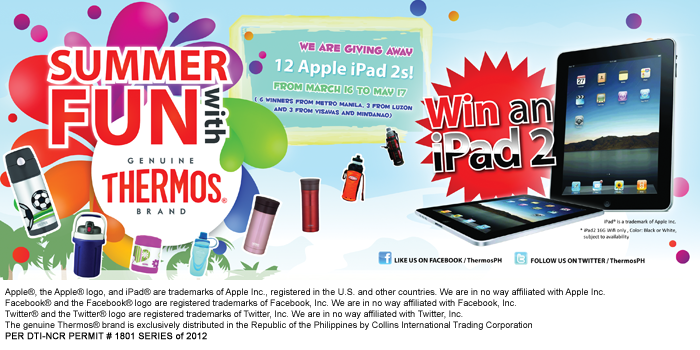 Links of considered photo entries will also be published on the official Thermos Facebook page and Twitter account. 7. Participants are allowed to publish their photo entries in their personal social media account. 10. The themes per period are: Excited for a Thermos Summer (March 16-April 5), Keeping It Cool This Summer with Thermos (April 6-26), and My Unforgettable Thermos Summer Memories (April 27-May 17). 11. A genuine Thermos brand item should be visible in the photo entry. Entries using generic/non-Thermos branded food and beverage containers will be disqualified. 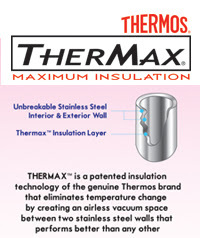 For more information about the genuine Thermos brand, participants can inquire atthermos@collins-international.com.ph, (632) 684 6160 or (632) 646 2867.
d. POPULARITY (10%). The number of likes of the photo entry and caption in the Thermos Philippines Landing Page which is supported by Manila Exchange website. 13. Entries will be judged by three (3) representatives from Collins International Trading Corporation. 14. Winners will be announced three (3) days after the last day of the period. 15. Winners will be announced in Thermos Philippines Landing Page which is supported by Manila Exchange website, official Thermos Facebook page and Twitter account. They will be notified via courier, SMS, and email. 16. Winners should bring the actual letter sent via courier to claim their prize. Winners must also present one (1) valid ID. 18. Failure to submit the required documents forfeits the prize. 19. Failure to claim the prize in person by August 30, 2012 forfeits the prize. 20. All participants can only win once during Summer Fun with Thermos Online Contest. 21. This contest is only applicable to the residents of the Republic of the Philippines. 22. Employees of Collins International Trading Corporation, promoters for all Collins products and their relatives up to 2nd degree of consanguinity and affinity are automatically disqualified. 23. All entries will become the property of Collins International Trading Corporation, and may be used for any online/printed promotional materials and press releases. By submitting the photo entry the participant is agreeable to this portion. 24. This promo cannot be used in conjunction with other promotional activities.